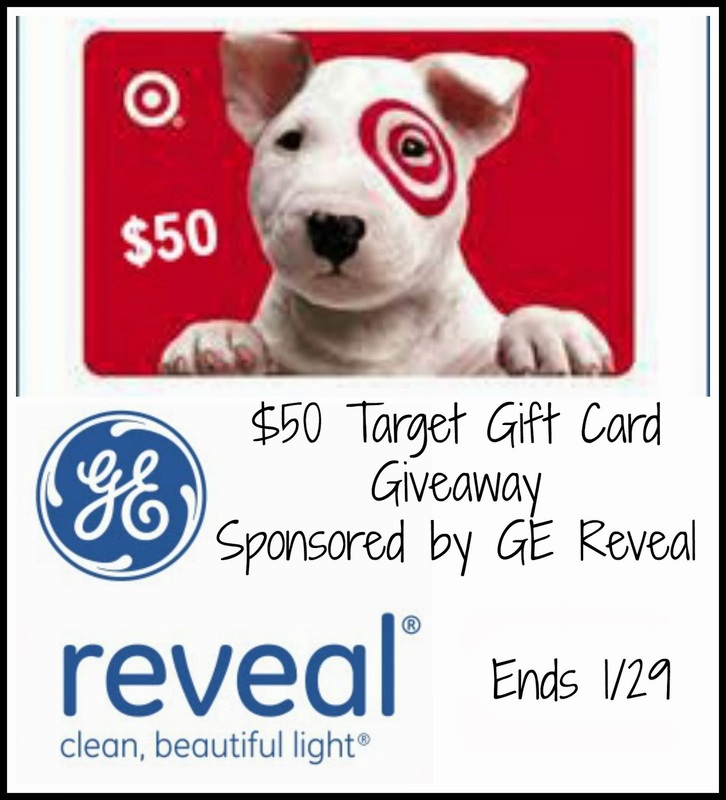 $50 Target GC + GE Reveal Lightbulbs Giveaway! The winter can be a dull and drab season and you might be feeling its effects in your home. Maybe it’s time for a makeover! A quick and easy way to makeover your home this winter is to switch to GE Reveal lightbulbs! GE Reveal Lightbulbs add a clean light that make the colors in any room pop! GE Reveal Bulbs provide a clean full spectrum light that filters out the dull yellows that standard incandescent light bulbs create. You can makeover any room with GE reveal’s Innovative Clean, Beautiful Light™. Make sure to print this $2 off any package of reveal® light bulbs COUPON now! You can save even more when you use Target’s Cartwheel App! Pair your coupon with the Target Cartwheel savings through February 1st for an even bigger discount! With the Cartwheel App, you can browse ahead of time for savings opportunities at Target. Scan the barcode of any produce to see if there is a Cartwheel savings! You can download the Target Cartwheel App on your iOS or Android devices. Momma Lew’s Blog & all participating bloggers are not responsible for prize shipment. 15 Responses to $50 Target GC + GE Reveal Lightbulbs Giveaway! I’d make over my kitchen. I’d love to makeover my master bathroom. I am dying for a kitchen makeover. My stepson’s room; it’s a cave now and could do with a whole new approach. I would love to make over my kitchen! I would so do my kitchen! I would make over all of our bathrooms! I would love to make over the dining room! I am happy with all my rooms. I would makeover my bedroom! I Would makeover my master bedroom! I would makeover my living room! Our bathroom is in DIRE need of a makeover. Some new decorations, or floor mat colors, SOMETHING! My living room could use some new lined curtains, to keep all of this cold from drafting into my apartment. This gift card would definitely help with that project!